The Red & Black circulates the largest college newspaper in Georgia. Each week they distribute 10,000 copies of the print edition both on and off campus, reaching nearly 45,000 students, faculty and staff. The print edition — and daily online content — cover University of Georgia and Athens news, sports, arts, music, culture and opinion pieces. 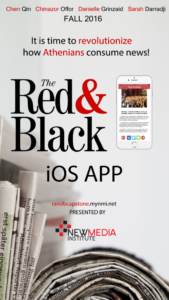 However, until now the Red & Black has been without a user-friendly way to consume news digitally via a mobile device. According to a recent study by the Pew Research center, 66% of adults who own a tablet or a smartphone get their news from these devices. That is where we come in. This semester we have been tasked with creating a news application for the Red & Black. This application is important because it brings this publication that many depend on for news into the new digital age. Our app is easy to use, simple in design and makes reading news something to look forward to! From researching other news applications like Buzzfeed, New York Times, and Google News and Weather; we have realized the power behind a clean easy to navigate design. Simplicity in design is key to overall user experience. These are all important things for any news app to properly engage their audience. The Red & Black app was made using the Swift coding language for iOS and the Xcode application. Since user experience is the most important aspect about a news app, we have been focusing on functionality as well as design. The specific details we have used to reach this goal are utilizing a swipe like function to transition between articles and a hamburger style menu. A hamburger menu is the name given to the menu icon found in newer programs. It makes viewing program options easier on mobile devices. This app will revolutionize the way the Athens community consumes news locally. This app will help launch the Red & Black into this new digital age where mobile news is a main focus for publications. The app will hopefully promote a larger readership and also increase brand loyalty. Focal point: To motivate members of the Athens community to utilize mobile applications for news consumption. We learned that mobile is the new normal and consumers are embracing it as a top method for media consumption. We also learned that typeface on a simple app can be EVERYTHING. And finally, teamwork is key to developing a promising product.